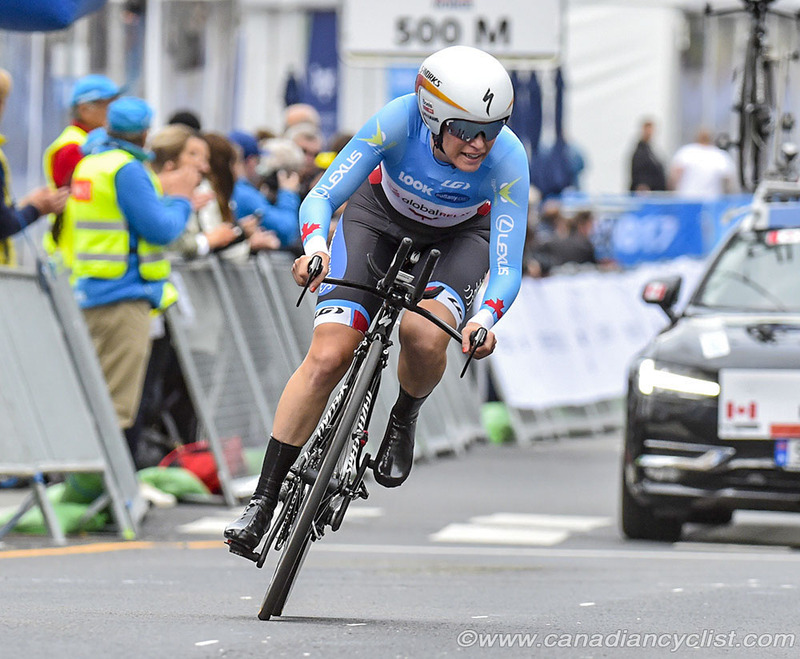 Karol-Ann Canuel of Gatineau, Quebec, was Canada's top finisher on Tuesday at the Road World Championships in Bergen, Norway, finishing 21st in the Elite women's time trial. 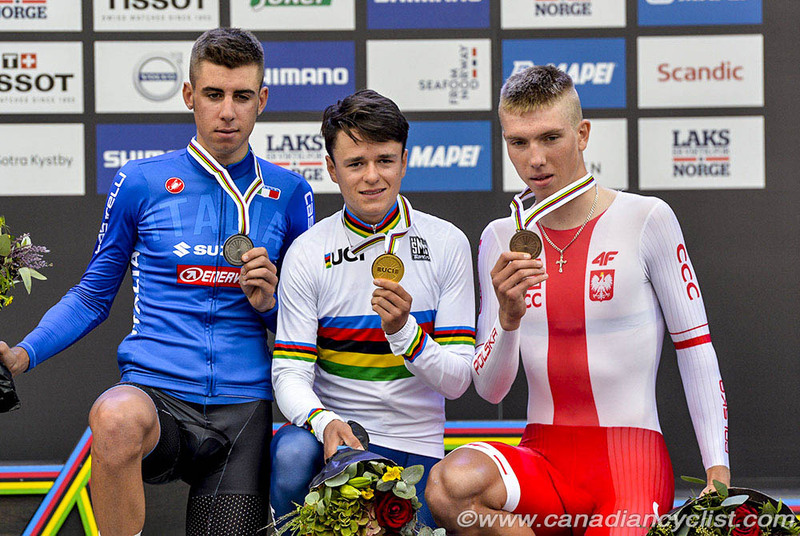 Charles-Etienne Chretien of Amos, Quebec, was the top Junior man in 28th place. 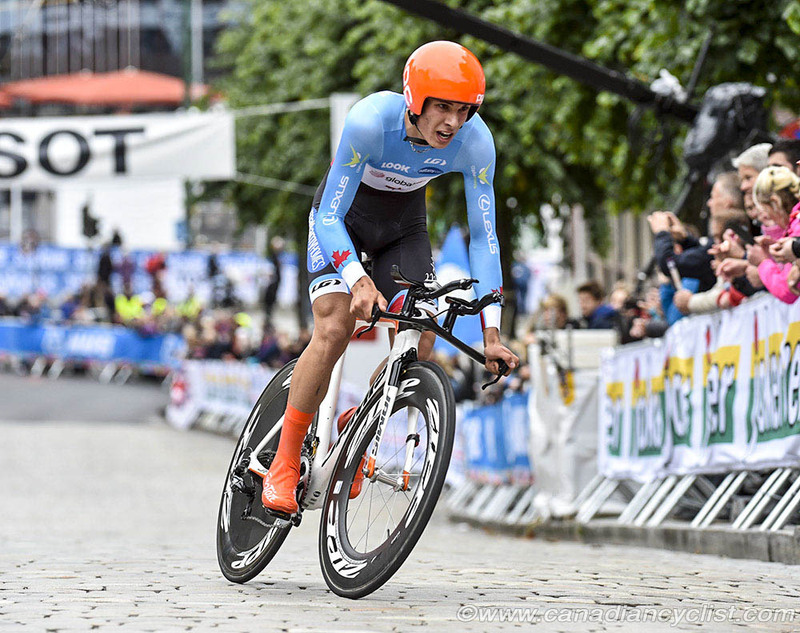 Canuel, who was on the team time trial squad that took the silver medal on Sunday, was 29th at the first intermediate time check, but improved through the middle portion of the 21.1 kilometre race. 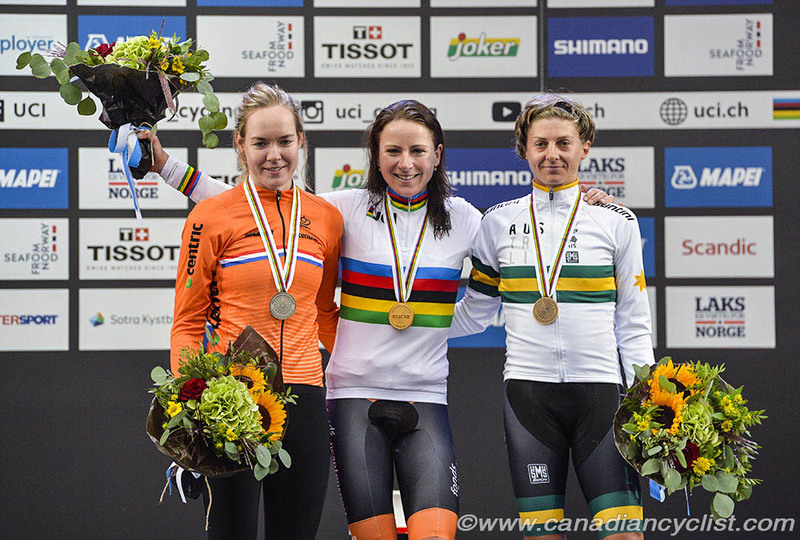 The Canadian time trial champion finished two minutes and 18.95 seconds behind winner Annemiek van Vleuten of the Netherlands, with another Dutch rider, Anna van der Breggen taking silver and Katrin Garfoot of Australia bronze. "It was really technical and fast, and also a lot of climbing; there was everything today," commented Canuel. "The most technical part was wet when I rode it, which made it even more challenging. I didn't have a great day out there; maybe I didn't recover as well as I hoped after the team time trial, but that's bike racing. Now I'm focussed on the road race for Saturday." "I've had a chance to see part of the climb for the road race now, and it's harder than I thought it would be. For the women it is a longer race than usually, so it will be really, really challenging." Van Vleuten, who crashed heavily last year in Rio while leading the women's Olympic road race, rode later in the field, when rain hit part of the circuit (which Canuel was also caught by). "I still cannot believe it," van Vleuten said after her victory. "This season I keep surprising myself with what I can do. To be world champion in the time trial I never thought I would be able [to do] this. This year I started to believe in it and to finish it off is incredible. It was really hard because it started almost pouring rain on the course. I did my practice in the dry conditions so I had to be really careful and for sure I lost some time there." In the Junior men's race of 21.1 kilometres, Chretien was 45th after the first split, but improved 16 places over the next two time splits, eventually finishing one minute and 30.91 seconds behind winner Thomas Pidcock of Great Britain. Canada's second entrant, Graydon Staples of Orillia, Ontario, struggled during his race, finishing 62nd. "I'm happy with my effort today," said Chretien. "We decided to go hard from the start and in the uphill for the first half, and it paid off for me. I was able to catch my breath in the descent and survive the last part of the circuit. I was hoping for a top-30, so I'm happy with the result. It was a beautiful course, but hard to plan when to give more and when to recover. I can say it was the most technical circuit I have done for a time trial." "It was a good day for us," said Pascal Choquette, the Junior Coach, "because both guys emptied the tank and gave what they had today. Technically, they were good and they followed our plan on how to distribute their power. Charles-Etienne did a good effort today."